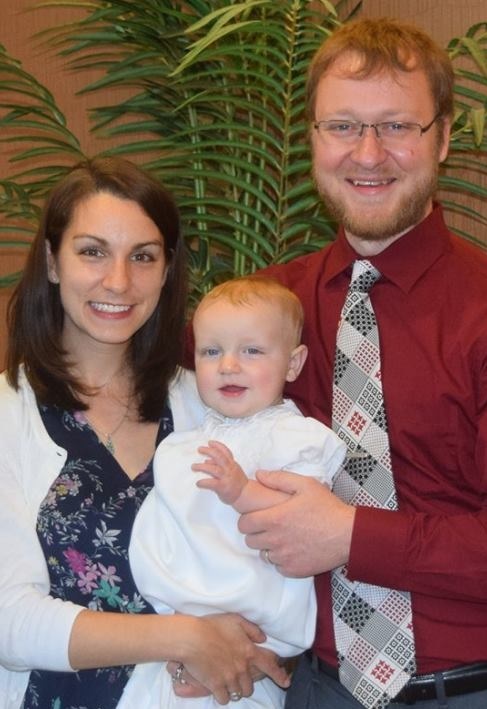 A few weeks ago on a lovely Sunday afternoon, Ben and I took a trip to Anderson Orchard with some friends from church. 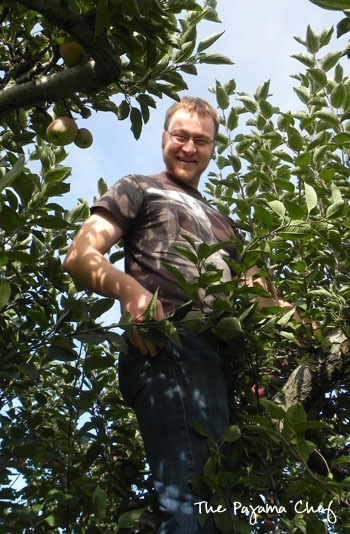 We had a great time picking apples [Ben climbed the trees to get the best ones! ], eating yummy apple cobbler from the concession stand, and just spending time with friends, of course. Our apples were a mixture of Jonathan, Jonagold, Red Delicious [totally different off the tree than the boring, overly waxed hotel lobby variety], and possibly some others. We just wandered the row We just love apples… you can never have too many! Except honeycrisp. I’m the weirdo who doesn’t like honeycrisp. But back to the apple orchard… Aside from the peck of apples we picked [about 10 pounds], we also bought a half peck in the farm store that was pre-picked. 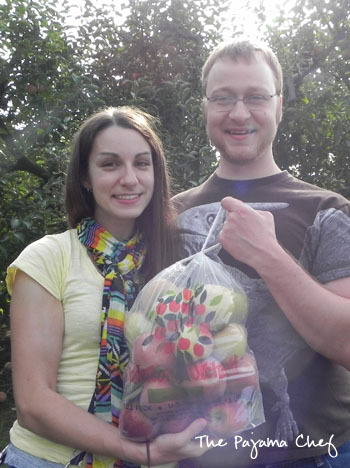 So we came home with close to 15 pounds of apples… only some are shown below… this was when our bag wasn’t full yet. Soon after getting home from the orchard, we made a big batch of crock pot chunky applesauce. I had big plans to bake and bake and bake lots of apple deliciousness. Then I got busy with my thesis, then I got a cold. Excuses, excuses. So I just ate tons of sliced apples with gobs of creamy natural peanut butter. Yum, yum. Then comes Friday night. Being the exciting couple that we are, Ben and I went running after he came home from work then made some stellar black bean quesadillas for dinner. We cleaned the apartment, did laundry, carted a bunch of Goodwill donations to the car, and watched some Parenthood, Netflix style [I’m a season behind–no spoilers please!]. Then at 10:30 pm, I decided I needed to bake. NEEDED TO BAKE. It was like, a necessity. I wasn’t sure what to make, but it was too late to wait for butter to soften so muffins it was! Ben retreated into his video game room [aka the guest bedroom] while I made a mess in the kitchen, eventually emerging with these amazing treats of joy. Yes, that’s their actual name. Well, it should be. 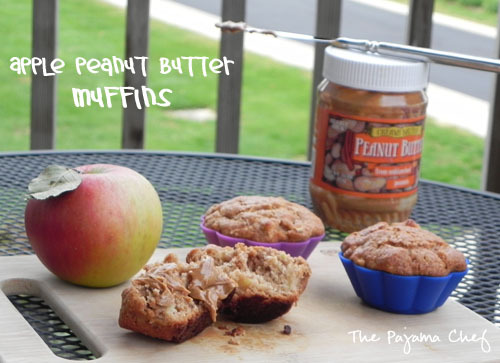 Apple Peanut Butter Muffins are a great spiced muffin–the perfect combination of warm fall spices [cinnamon! apple cider!] as well as a nod to the quintessential healthy snack combination [apples and peanut butter]. I cannot even begin to express my feelings about these muffins. I just cannot stop eating them and savoring each chunk of apple that dots the light and fluffy muffin. Wait–light and fluffy, you say? To keep something peanut butter flavored light and fluffy, I had to reach deep into the pantry for a solution. In the past, I have found that adding straight-up peanut butter to muffin batter usually renders them a bit dense. So, I decided to use peanut butter chips instead. And let me just be so bold as to say that this was a fabulous decision! To mimic the peanut butter burst enjoyed when dipping an apple slice in peanut butter, I clustered the peanut butter chips in the center of the muffin. However, if you want to share the love, feel free to mix the chips into the batter. I’m sure that would be great too! I thought the best way to enjoy these muffins was with a fresh dab of natural peanut butter on top, but Ben would completely disagree. He’s just weird though. 🙂 I say more is better. Enjoy! Preheat oven to 400 degrees. Line muffin tins with paper liners or grease well with cooking spray. In a large bowl stir together flours, sugars, baking powder, and cinnamon. Reserve 1/4 cup of the dry ingredients, then toss with diced apples. Next, whisk together cider, oil, and egg. 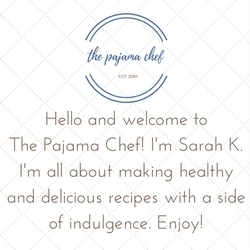 Pour into dry ingredients and stir until just moistened. Fold in apples. Scoop about 2 tablespoons batter into muffin liners, then top with 5 or 6 peanut butter chips. Fill the rest of the way with batter. Bake for 17-20 minutes, or until golden brown and a toothpick inserted in the center comes out clean [be careful not to land an apple instead!]. I am the same way when it comes to baking. Sometimes you just have to bake! 🙂 These sound great! I love the peanut butter chip cluster in the middle! 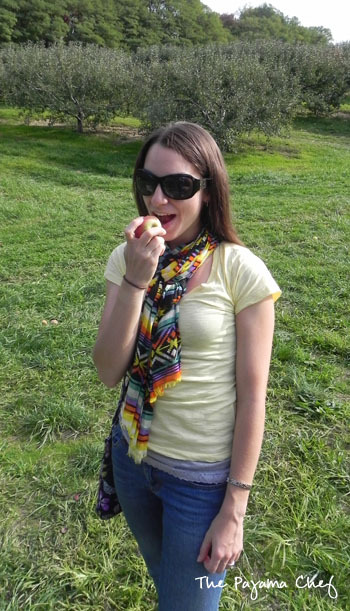 Looks like you had a great time apple picking and making good use of your bounty! These muffins are to die for! I really need to go apple picking before the season is up…so fun! And these muffins…swoon! 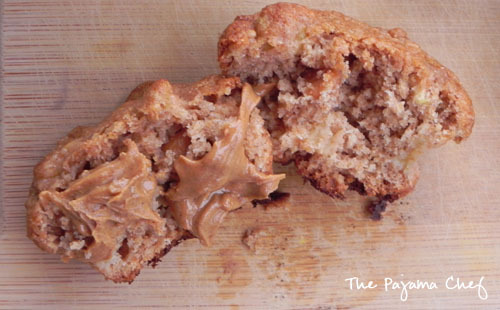 The only thing better than an apple muffin is an apple PEANUT BUTTER muffin. thanks girl! i’m not sure why i had never thought of it either, but then i did & was like, this is genius. 🙂 let me know what you think if you do try it!! I find your enthusiasm catching and I just know I have to make these! I really need to go to an orchard as I’m in applesauce mode right now, buying up tons of apples from the store to make applesauce with. Too cool that hubby climbed the trees! I’m going to tell Dennis he has to do that too–he’ll probably laugh at me. 🙂 Oh, question: do the chopped apples start to make a funky lighter-colored moist area in the muffin around the chunks after a while? That drives me crazy and is one reason I don’t like to use fruit in quick breads, except for mashed banana or applesauce. Oh well, even if it does…I’m so making these. Taste over beauty! well, truthfully i don’t know if it leaves those spots around the fruit. i would imagine it does because i’ve had that happen many times. however, my trick is to only leave quick breads/cornbread/etc. out on the counter for 2-3 days, max. it seems that they start to turn after that. the season doesn’t really seem to make much difference in our apartment. so whatever we don’t eat by then goes into the freezer, usually in snack bags for lunch, but sometimes in a big tupperware to pull out later. i made lemon cranberry muffins over the weekend, and ended up keeping them all in the fridge and they have been perfect that way since friday…so going on 5 days. this might be my new strategy! do you have any tips?